Little man is almost 9 months old and eating like he's 2. We've introduced a lot of food at this point - even peanut butter - and he's seems to like everything. While he eats almost everything we do, I still like to feed him veggie and fruit purees. The cube size food storage container weren't cutting it anymore, Dylan eats too much. I recently started using Tutti Bimbi's Food Freezer Storage Tray and the 2.5oz portions are perfect! This practical silicone tray is safe to use in the freezer, dishwasher, microwave and in the oven for up to 460°F. Plus you can freeze and store more than just veggies or fruit! Freeze or store breastmilk, use it as a jello mold, freeze left-overs, sauces, bake cupcakes or cake-pops, the possibilities are endless. The non-stick flexible silicone material makes it so easy to pop each portion out, no need to push your fingers in the food. It's sturdy and resistant silicone clip-on lid protects your food from any outside smells. SPECIAL OFFER: Buy two trays and receive free shipping. This looks like a great product. It's really hard to get the food out from them ice cube tray I have. Those are neat. I hate throwing away food, and it seems like I do it all often. Maybe these would help. 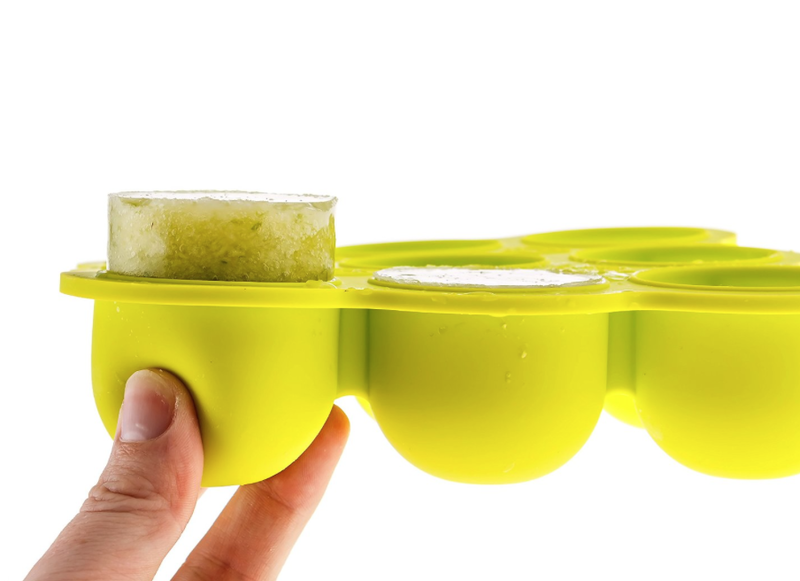 I've also tried ice cube trays and they kind of drive me cray. Of course, my little guy is all but refusing to let me feed him from a spoon, so we're kind of taking a little break from purees.